I love love love picture books. I love art, I love words, and I LOVE the magical combination of the two found in exemplary picture books. I have an odd sense of humor, I'm drawn to the quirky and the odd and bow down to good design. Naturally, some of my favorite picture books are ones that don't work in storytime, but are ones that I look forward to sharing with my own (theoretical) children someday. 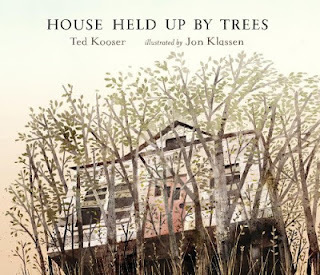 House Held up by Trees by Ted Kooser, illustrated by Jon Klassen. Not everyone is going to understand this story. Many people are going to reach the end and feel like it is abrupt, and strange and..."I just don't get it." That's ok: Every book its reader. I am a reader for this book. And the art! Total Jon Klassen fangirl here, not going to lie. Have you seen the jacket he designed for the book The Watch that Ends the Night? GORGEOUS. This book lacks the humor of Extra Yarn or I Want my Hat Back, but that really allows readers to appreciate the gorgeous subtlety of Klassen's amazing artwork. 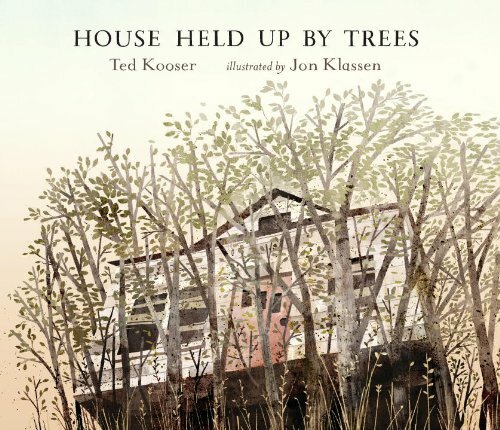 He does wonderful things with texture, color, and perspective in this book, keeping each page turn fresh and interesting when the story is largely static (I mean, there's not a lot of action in a story about a house and trees over several decades). The imagery Klassen uses adds so much depth to the story--the seeds floating through the sky (beginning on the endpapers!) representing the inexorable pull of nature in our lives, and the red folding chair providing an anchor to our eyes throughout the story. So good! Also, this book is set in Mrs. Eaves, which is one of my favorite fonts. Perfect! Give this lovely, thoughtful gem a try. Preferably sitting under a tree or, considering the weather, at least in a window seat. *Sorry Giving Tree fans. Also, a tangent: The Diary of a Wimpy Kid bit about Shel Silverstein's scary author picture on the back of The Giving Tree? PURE GENIUS. Jeff Kinney, I salute you).